The first thing that a consumer looks for about a brand is its reputation. What have you done to build that reputation that will encourage more people to trust you with their needs? Well! You might have no answer. That’s because we often confuse branding with reputation. In today’s digital world, creating brand awareness is not that difficult. Through blogging, paid ads, SEO marketing, website creation, etc. you can build a brand. However, don’t mistake that as a reputation. You may take your business to every customer but making them rely on it is the challenge. That is where the process of building a reputation starts. It doesn’t happen in a single day. Reputation is an undeniable asset for any business or company. You need to make your audience believe in what you offer so that they take interest to invest in your brand. For established businesses, advertising their brand to gain attention is easy as they can spend a lot on it. But, dollars cannot buy reputation for them. Even they too need to build it like any other business of small size or startups. There are various factors by which a customer considers your brand good or bad. From product quality to standing up to what you promise, you can build a reputation in multiple ways. Here are some of the productive and proven practices that you can implement in real life to make your brand favorite of all. Promise what you can fulfill. However, many companies forget to stand up to their promises and end up being on the receiving end of customer wrath. For the sake of marketing and promotion, brands make alluring promises to customers. But they never think of the outcome or the impact of their lie. While on the contrary, if you can meet your commitments, nothing can be better than that in building a reputation. You must make promises that are attainable, and you should clearly state your capabilities to the audience. Just by saying ‘we offer a quality email list,’ you can attract attention. But when you fail to offer so, you end up destroying your brand’s image. You will end up losing customers who will no longer trust your brand or the product you sell. Every brand has a logo and a message that summarizes their overall functional efficiency and capability. When your brand is better than the competitors in a specific area, then don’t hesitate to flaunt it. Every brand is unique and best in one or the other way. But as there is too many selling the same product, it is confusing for customers to choose one. You can help them make the right choice in your favor by showing them your strength and expertise as a brand. Make use of compelling and convincing words to portray your specialty to your targeted audience. This way you can encourage them to take your brand seriously and pay attention to what you offer. When you are proud of your brand, be confident and loud enough to say it to the world. Doing so will encourage your customers to know you more. And slowly in the process, you can earn an excellent reputation for your brand. An honest representation of the brand always works in your favor. Your services and products are for customers and so never lie to them. If you’re best at something, exuberate that up to a certain extent and don’t go over the board with dishonest claims and presentations. When you are transparent to the customers, and they know what you are up to, they will respect that and rely on you with their business. There is nothing wrong if you commit a mistake as that’s human nature. But when you deny that and try to hide that is when you make a blunder. Today’s digital-savvy customers are not dumb. They keep track of everything. From product review to testimonials, they analyze a brand before investing. Don’t pretend to be something that your brand cannot deliver. A happy customer recommends your brand to others. Hence, your priority as a business owner should be to deliver excellent service to customers. It can be both in terms of product quality and assistance. Right from product purchase, delivery and after sales service, you need to make sure that every interaction delivers an unforgettable experience to clients. So that audience starts relying on your brand as a trusted source that addresses their needs efficiently and on time. At each touch point, provide customers the ease and convenience of associating with your brand. Perhaps, you can use this as a plus point that will differentiate your brand from the others. Don’t keep the customer waiting for a solution. Be instant in your social media responses and attaining customer queries via telephone or email. When you make your customers feel valued, you start building a sense of reliability and trust in them that adds on to your reputation in the long run. Their word of mouth advertising that promotes your brand is what you get in return of satisfactory customer experience. If something your brand does annoy or irritates or disturbs the customer, negative feedback and reviews are apparent. Instead of hiding it or controlling it, welcome such responses with open arms. Such reviews will help you to do better and improve for the best. You can provide customers with proper outlets or grievance cells where they can post their experience with your brand. If they criticize, don’t get disheartened. Take those criticisms, find their cause and address them to show clients that their feedbacks are valuable. Most of the brands have the comments section on their website, especially on the product page. However, they hardly note what people are commenting and so provide no timely solutions. As a result of which, they continue annoying the customers which severely affects their brand reputation. All these add up to your worries, hampering your years of efforts in establishing the brand. Moreover, negative feedbacks hint at the weaknesses of your product or service so that you know what you are doing wrong. Criticism will only help you improve and grow as a business. When you start accepting your faults and begin to work on the solutions, customers start believing in you. The answer for an insult or negative opinion cannot be the same. Often, the brand makes the mistake of mishandling an angry client. And that is where they go wrong, impacting brand reputation badly. Moreover, people start discontinuing any contact with the brand. Most brands today engage in social media marketing to expand their reach and create awareness about their products. But, such platforms don’t always work in your favor. They can even backfire. As people now leverage social channels to outburst their emotion, share reviews, express their disappointment on a specific matter. Any unsatisfactory experience with your brand may result in embarrassing social media posts pointing out your mistakes. That’s what customers do nowadays. Instead, of calling customer service, they direct tag the brand with their problems, letting the entire world know what you did wrong. In most of the cases, we notice brands indulge in mudslinging on social media sites with customers. Heated arguments, rude responses, and an unstoppable social media war are what we witness. Such kind of approach will not help at all. Therefore, it is crucial for a brand to maintain professionalism when dealing with clients. A wrong tweet or an aggressive reply to a customer will hamper your brand. The faster you understand, the better you can prevent spoiling your brand’s image. It is always advisable to politely respond to the customer and be quick in addressing their concern with immediate solutions. You should avoid engaging in arguments on public forums. An email or a phone call seems ideal to deal with annoyed customers. Also, never get angry or act rude to the customer during both online and offline interactions. If you do so, you will risk your brand reputation on social networking sites like Facebook, Twitter, etc. where millions of users are networking. Your staff, social connections, partners, influencers and everyone you associate for business represents your brand. Their behavior and opinions directly affect the reputation of your brand. It also impacts brand credibility on different digital platforms. Hence, make sure the people you follow or connect with on social media are reliable and possesses a good reputation. Make sure that the professionals you appoint must understand, follow and align with the standards and ideologies of your brand. The entire team should have proper training and knowledge of what purpose your brand serves. Everyone should be on the same page when it comes to reaching the common objective. 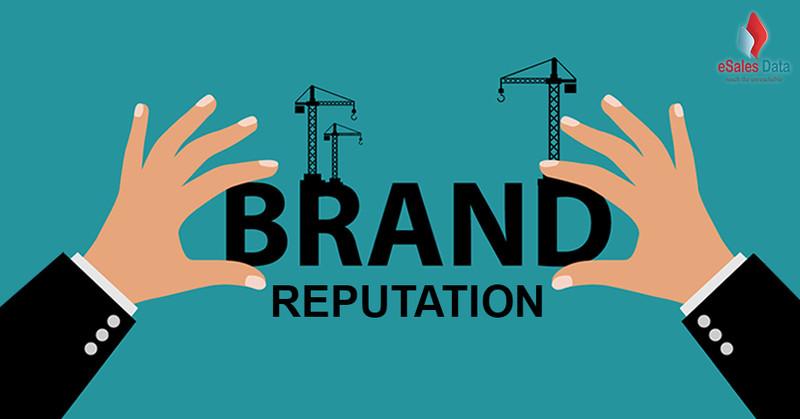 When a staff representing your brand online misbehaves or disappoints the customer, the negative opinion the customer develops is about the brand. Specialists should have customer relationship management skills in place to offer the best brand experience to clients. Unable to dos o will only bring disrespect. Your story on social media should aim to build relationships, drive trust, and bring in more opportunities for your business to excel. Consumers can quickly come up with a new or a past issue they had with your brand and share their experience on social media. Now, out of nowhere if an old matter forefronts you might not know its origin and related records. That is why you need to monitor your brand’s reputation on a regular basis. It is essential to keep track of the feedback, reviews, and complaints about your brand coming across from all the channels. There are occasions when misleading information spread by competitors confuses the customers, encouraging negative thoughts in their mind. But often, you end up knowing about them when it’s too late. However, you can avoid last moment rush in handling those situations if you have prior about such developments. As a responsible business head, you must have good social listening skills. This will help you to prevent the spread of any misconceptions, rumors, or someone’s effort to spoil your brand reputation. Remember, you cannot build a brand reputation with money alone. It solely depends on the kind of understanding, bond, and the relationship you share with your customers. Winning their trust is the key to your business success. Unhappy customers are likely to attract no business or profit. Hence, make sure that all your products and services aim to keep customers happy and content. Also, remember to fill every customer interaction with impromptu service, polite behavior, professional outlook, and a high level of personalization.